With a wide variety of international and local banks in Singapore, it can be difficult to select the right bank. As you struggle through a labyrinth of transaction fees and paperwork, you may start to wonder if visiting exotic lands is worth all this trouble. Having thrown myself into the morass, I have survived to compile an easy guide for you to follow, which will render the entire process a walk in the park! If you are an overseas resident and want to open an account in Singapore before actually moving here, you can do so easily. You do not even need to visit Singapore to open an account! You apply online by submitting an application form to your chosen bank, if you have your documentation in order. However, this process is restricted to residents from certain countries – before trying to open an account in a bank in Singapore, always check the bank’s website for eligibility. Irrespective of your nationality, the following tips may come in handy for opening a bank account! The first thing you need to keep in mind is the paperwork involved in opening an account, whether you are a foreigner or a resident of Singapore. You will need a valid passport, a study or work visa, address proof like a utility bill or an official letter from your school or employer, and a reference letter from your current bank if you are a foreigner. If you are a dependent spouse, you cannot have an individual account, and can only operate a joint account with your working spouse. After you gather the necessary paperwork, your next task is to select the bank to open your account. 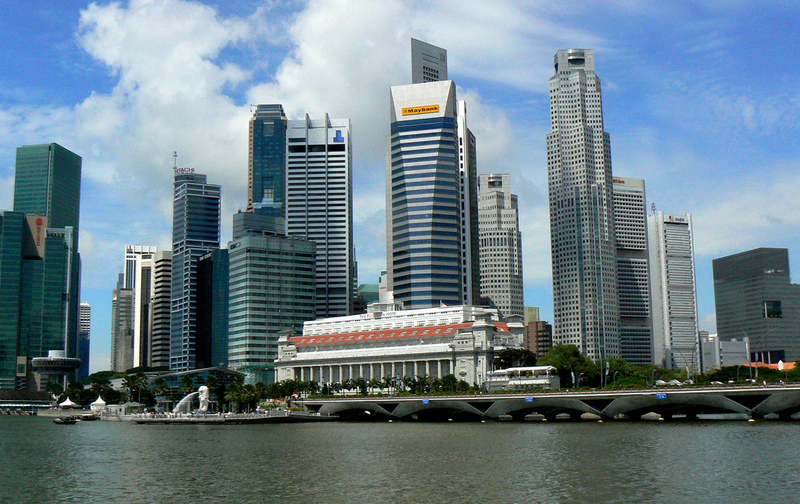 Most banks with foreign origins have restricted presence in Singapore, and only operate through a few branches that are located primarily in the financial district or upscale areas. Locating a bank that has a branch near your residence and workplace should be top priority, in the event of financial issues that can only be resolved through personal meetings. The chosen bank should also have a large number of ATMs located throughout Singapore, letting you withdraw cash without charge as and when required. The ATM5 network comprises of major international banks like ANZ, HSBC and Standard Chartered, and participating Citibank and Maybank ATMs that bear the ATM5 logo. The participating ATMs offer free withdrawals, with no hidden charges. The local banks also serve well, with more than 900 ATM counters throughout Singapore. For future convenience, open an account at a bank that is open on Sundays or have extended hours on Saturdays. Banks in Singapore normally operate during office hours – 9:00 AM – 4:00 PM on weekdays, and 9:30 AM to 12:30 PM on Saturdays. Visit the bank’s website or have a discussion with their helpdesk, and familiarise yourself with the fees associated with transactions. All banks have a fee structure for local and international transfers, and prior research will enable you to choose a bank that charges minimum for such transactions. There may be charges for issuing new check books or for standing orders – choosing a bank that does not implement such service charges, or at least one that has reasonable rates, is always wise if you have numerous transactions. Check if your chosen bank has an app that can provide internet or mobile banking. The bank should offer complimentary transaction alerts through SMS messages, so that you are kept abreast of every transaction in your account. This will help prevent debit or credit card fraud, as well as helping you keep track of your account balance. With internet banking, you are able to easily access your bank statements, and transfer money between different accounts. Some banks may even compound these charges quarterly, which will drain your account if you are not careful. Select a bank that has the facility for maintaining the minimum balance, without levying penalty charges. Most banks operate on the NETS scheme in Singapore, These schemes offer ATM cards that can be used at retail outlets without incurring charges. If you charge purchases to your ATM card frequently, NETS is made for you! All banks provide ATM card facilities, but using them comes with service fees. Using a NETS card will help you avoid these charges. These requirements vary from bank to bank, and it is always prudent to check before contacting the bank to open an account. You need to be above 18 years of age to open a deposit and savings account. 15-18 year olds, you can open a savings account – your parents or guardians can also open an account on your behalf. You will then be required to bring in your passport, with the minimum deposit amount required for opening the account of your preference. If you have the required paperwork, opening an account in a bank in Singapore is relatively easy and hassle-free. However, there is a waiting period involved, and it may take approximately five working days to activate your account. After the initial paper wrangling, you will find that banking is a pleasant experience in Singapore.